You’ve probably noticed that the spring flowers in your garden are starting to bloom and we are certain they look absolutely lovely, especially after the recent rain we’ve received. As you’ve been admiring that garden, you’ve also probably noticed there is more buildup of dirt and grime on your windows and well frankly they’ve lost that sparkle and shine you love while looking out or in. Not to worry! Simply pick up the phone and give Blind Appeal a call and we’ll come out and restore that sparkle and shine to your windows in no time. Just think, you are only a phone call away from feeling like you can pull up the shades and not only show off that beautiful spring garden, but also your crystal clean windows at the same time without having to feel embarrassed that you haven’t gotten to that chore yet. Here are three reasons why having your windows professionally cleaned in the spring is a great idea. Spring is an active time of year and you may find yourself peering out through the windows more frequently as you watch the grass green up and grow a little taller, gaze out at those beautiful flowers, or look at that veggie garden you are preparing to plant. Of course, these views are even better when you can see clearly in and out of your windows without the headache of having to look at all layers of dirt and grime that’s built up. You’ll find that by having your windows professionally cleaned both inside and out you’ll be able to enjoy the spring sun that shines into your home that much more and love the warm feeling having clean windows creates in your home. The bugs and pests are starting to crawl or fly right about now and with that you’ll want to make sure they stay out of your home. Having your windows professionally cleaned in the spring is a great time of year because our expert technicians will make your windows look so great you won’t have to open them to see outside! The spring rains have left dirt and grime behind, which have formed a layer of film on your windows. You’ll want to be sure to have this professionally removed before the warm sun starts to bake that onto your windows making cleaning more difficult. Also, it’s a good idea to remove the dust and grime that builds up in the tracks of your windows and doors as this helps prevent allergies. Yes, we can appreciate by now that your spring to-do-list is growing quite long and that’s why we’d like to help you check one more thing off the list by calling in the professionals to clean your windows. Let our experts remove the dirt, grime, and dust from your windows today, so you can enjoy the crystal-clear views again that you love so much. When caring for window treatments we often overlook some of the important cleaning tips in how to care for our blinds once they’ve been hung in our home. Yes, custom blinds may be one of those items you’d rather install and then forget about them, but don’t put blinders on when it comes to maintaining and caring for your custom blinds. Here are a few helpful tips to keep your window treatments looking fresh, clean, and well cared for. Any window treatment could benefit from a good dusting at least once a month. With regular upkeep, dust will brush off the surface of the slats of mini blinds, wood blinds, and the vanes of vinyl and aluminum vertical blinds since they are quite smooth. These surfaces can easily be dusted regularly by tilting slats up first, then down to reach the entire top and bottom surfaces. A soft dusting cloth can be used, and a feather duster works well on fabric shades. You can find several products specifically made for dusting online, so do a google search and you’ll discover the possibilities are endless. Use the brush dust head attachment for your vacuum for a more thorough cleaning. If cleaning a mini or wood blind, tilt slats as described above. Often vacuuming is a preferred method for cleaning fabric shades. Spot clean with a soft cloth or sponge and a mild detergent and warm water when cleaning vinyl or aluminum blinds. Blot gently and allow to dry completely. Spot cleaning is not recommended for fabric or wood window treatments. Also, do not try cleaning fabric or wood surfaces with water, club soda, soaps, or cleansers of any kind as they could damage the fabric or wood. It is recommended that all fabric products be cleaned by a professional drapery cleaner or dry cleaner with specific experience in decorative fabric window treatments. When caring for your window treatments you’ll want to be sure to follow the manufacturer’s recommendations for care and cleaning. Also, it’s important to know when to call in the experts and hire a professional cleaner who can help you properly maintain and care for your window treatments. If you are looking for a local expert to help you, we highly recommend Wally Bashaw with Clean as a Whistle. Give him a call at 208-859-3363. Clean your window treatments at least once a month to help keep dust and dirt away. 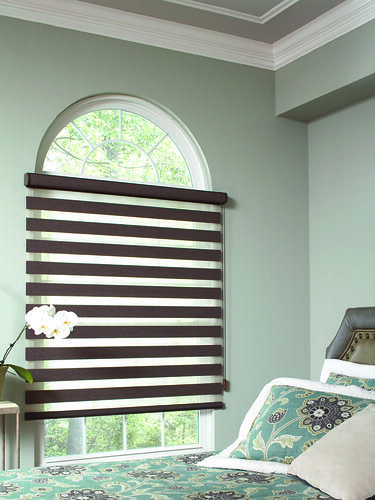 This not only helps keep your window treatments looking fresh but also helps you keep a better eye out for damage. If you purchased your blinds or window treatments from Blind Appeal, you will never pay for any repair. The Blind Appeal Service Guarantee means you can call us anytime to repair your blinds or window treatments for free! For more information on how to clean your blinds or window treatments or if you are looking for new window treatments, we can help! Call us today at 208.888.1056.